Sony's PlayStation Home virtual world launched two years ago tomorrow with nine games, 114 virtual items, and 25 community events. 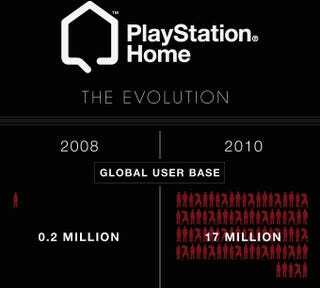 On the eve of its second anniversary, PlayStation Home is much, much bigger. At launch PlayStation Home wasn't nearly as interesting as we thought it would be when we first broke the news of its existence back in March of 2007. There were a handful of mini-games, a few items to purchase to customize your avatar, but on the whole it felt like a very expensive way to expose people to PlayStation 3 game advertising. In a post on the PlayStation Blog this morning PlayStation Home director Jack Buser shows off how much the service has changed with the large graphic you see below. More than 7,000 virtual items, 600 events, and a large number of games. And they aren't just mini-games any more. Games like the recently released space shooter Novus Prime and Mass Media's Midway have delivered full game experiences to the platform. Buser says there are more to come as well, with Jet Set Games' corporate espionage game Conspiracy and Outsu's futuristic racer Sodium 2 on the horizon. Have you been to PlayStation Home lately?